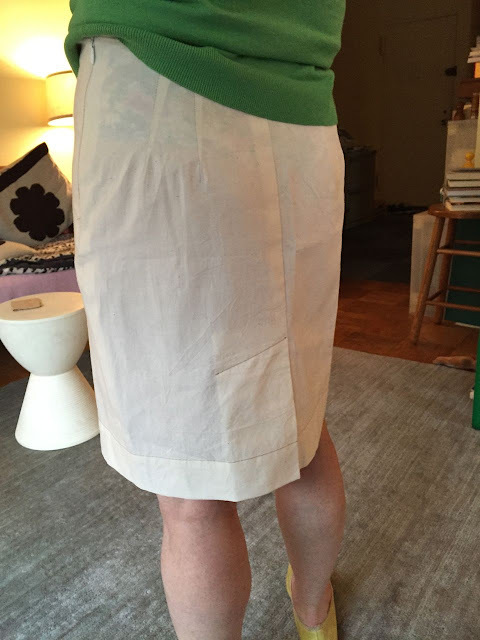 male pattern boldness: Susan's New Wrap Skirt Muslin + Back to the Bodice! 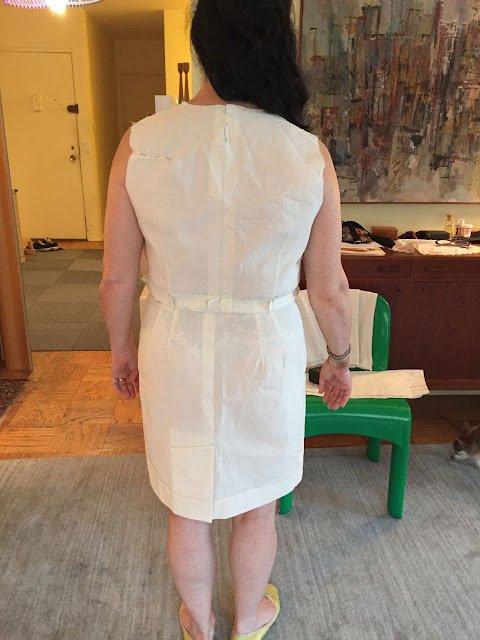 Susan's New Wrap Skirt Muslin + Back to the Bodice! 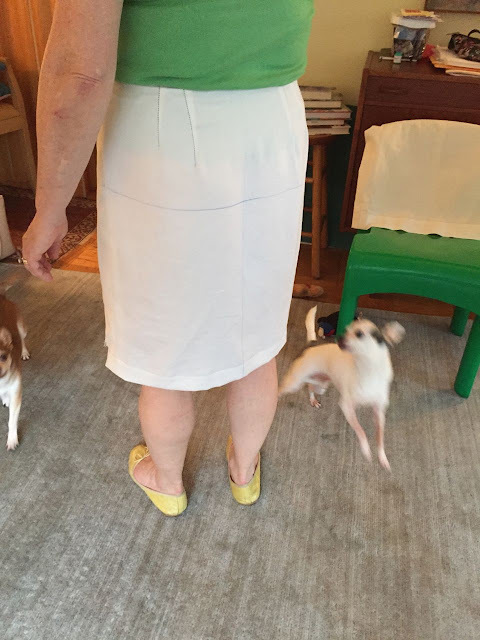 Susan came over for a fitting this evening; the dogs were so excited! 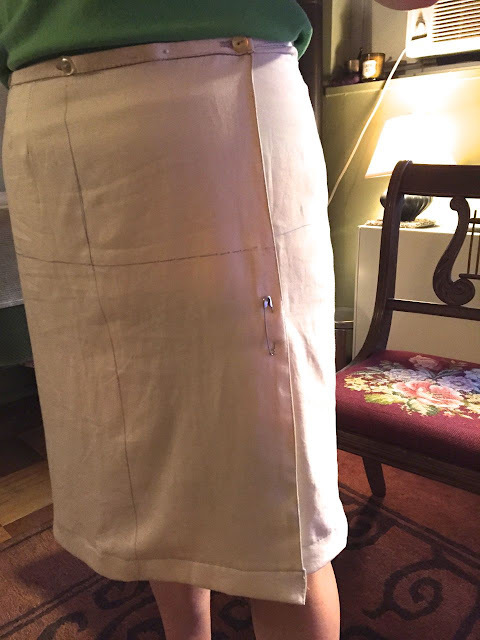 I made a new wrap skirt muslin with an overlap that extends 6" beyond the center front line instead of 3" (as in the earlier version). It's much more flattering this way. I chose not too add darts to the overlap even though it creates some asymmetry in front; I may change my mind. (I'd have to add darts to the facing too.) Do you think it looks odd? 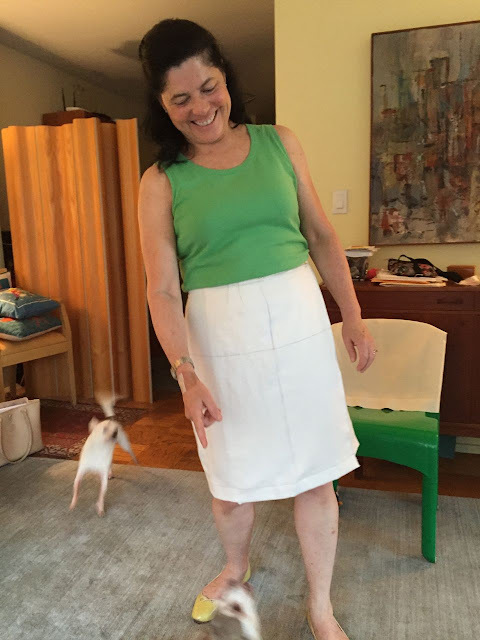 I added 1" to the skirt length but Susan's wondering if it isn't more flattering shorter. I made the wrap skirt muslin out of a very soft cotton sheet -- I wanted something that had more drape, like her final skirt will have. It has a texture similar to wool crepe. It fit quite well. Of course a skirt will shift a bit when you move in it, sit down, stand up, etc., but my horizontal and vertical balance lines stayed put. I added a 1/2" waistband that buttons along the overlap. Susan likes her skirts narrow, and she was concerned that the wrap skirt might look too A-line. I explained that the hip-to-hem line is straight but an option would be to peg it a bit. I think it looks flattering as-is, and the vertical line created by the overlap elongates her lower body. Susan liked the look of an oversized pin along the edge of the overlap (like you'd find on a kilt), just to keep the skirt from spreading too much. I might try to work that into the design (but with a better looking pin). 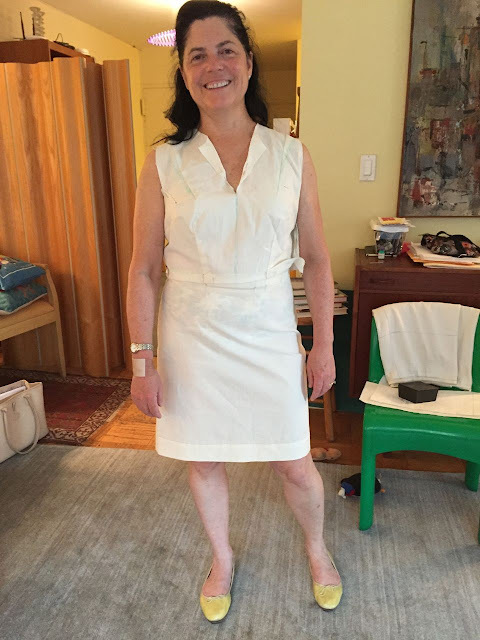 I know it's hard to tell from the angle of the photos and Susan's wearing flats, but does the skirt look too long to you? Finally, Susan tried on the bodice again. I think I'm ready to use this to create a front-buttoning blouse (muslin), either with cap sleeves or three-quarter sleeves. Since the blouse will made be in a soft fabric, I'm reluctant to overfit the stiff muslin bodice. I may actually unpin the back darts since she's going to need some ease back there once sleeves are attached (as a number of you reminded me). And that's it! I am excited to start looking at fabrics, which I hope to do before the weekend. I would love to have something ready for Susan by next week. Oh, do persuade her to keep the length - to my eye, narrower skirts like that can so easily look skimpy and undersized if they're much above the knee, and the proportions as it is are very nice. The skirt hits her legs just at the right spot! I think wrap skirts are better sans darts in the front. Wrap skirts are shifty little buggers, and having darts that have somehow managed to twist around to the side is irritating. As far as length goes, it's a little hard to tell from the pictures, but it looks like it's hitting her at the widest part of her calf, and that's not super flattering on anyone. I'd raise it an inch if that's the case. In these pictures, the camera is higher than straight-on, similar to what I (tall person) would see. The first skirt seems too long partly due to line-of-sight, whereas the second looks just right. I also like a balance between showing leg and showing arm; that she's in a tank top makes me favor the shorter skirt. 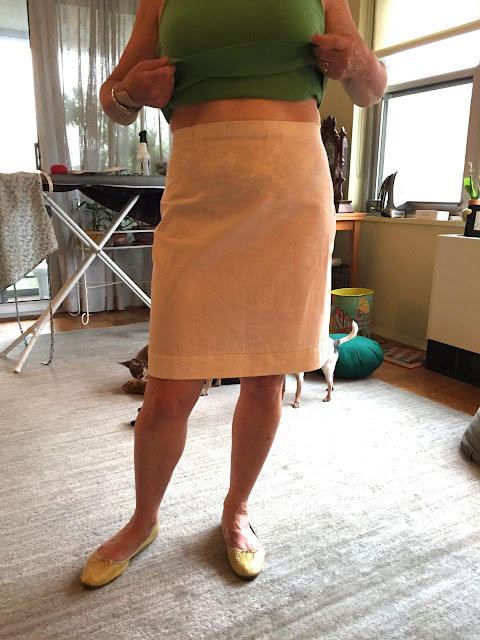 I think Susan is right - the wrap skirt is a tad too long, but otherwise looks good. The finished clothes are going to look so nice! The length of the straight skirt is better on Susan's legs and with her overall proportions. The longer wrap length is a trifle dowdy. However, the wrap skirt is otherwise perfection - you do beautiful work! Yup. Just like they said! Thanks for this series; it's a swell look into your process and makes me think about how mine works. I also think the wrap skirt is just a bit too long. It's hard to tell from the photos, though. But everything else is great! I can hardly wait to see the fabrics. The neckline on the collar is great for Susan I think and she looks great in both toiles. I like the length of both skirts but if Susan wants the wrap one the same length as the straight one I think it will look good on her. You are very good and extremely through with fitting and I have been very interested by your posting. I would leave any judgement about length to the otherwise finished garment - you can pin it up on her then. The fabric and drape can all impact the outcome, and the colour, and the top etc. Susan in summertime showing skin - suitable and stylish. Wonderful job! The fit is superb on all the garments. 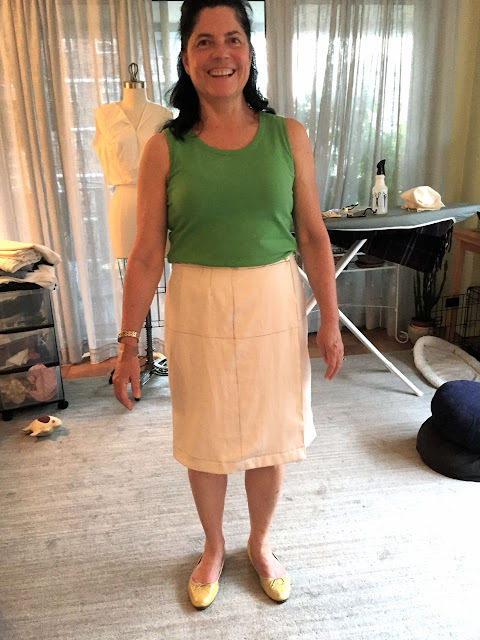 Since Susan has broad shoulders a narrower skirt will just make her shoulders look broader. An A line is really a better choice, but she's the client. I like the length of the skirts as is, the above the knee is really flattering on her, shows off her nice legs. If you make it longer it will hit a wider part of her leg, making her legs look stubby. If I was going to have darts on the front flap, I'd really make it a feature, and use 3 darts so it looks like intentional assymetry. However, aren't the darts usually on the underneath portion? You could make a contour waistband and get rid of the darts all together. Personally, I like my skirts to fit at the waist and NOT shift around. It's a beautiful skirt, but I think it is a tad too long. Above the knee looks better, less dowdy, on a short woman. I am a short woman and I like the longer version on her -- adds a little length which I think she needs to avoid that chopped in half look. Does she normally wearing flats? Heel height is so important to the final look -- a higher heel would look nice with the longer skirt. Sometimes she wears low-heeled slingbacks, but nothing super-high. Make her (nicely) bring the shoes she will wear with the garments! Also the undergarments- it makes a real difference. Very interesting to see this process Peter and well done on a beautifully fitting toile. Can't wait to see the fabric you choose. I think the wrap skirt should be shorter. It makes her look shorter/ dowdy. Btw I love these client posts you've been sharing. The skirt looks like its fitting very well. I see you have drawn the hip line to check for fit and balance, however I don't see the bust line and bust point drawn on the bodice muslin. Those points would greatly aid you in fitting and locating the darts since all bodice darts must radiate out from the bust points. 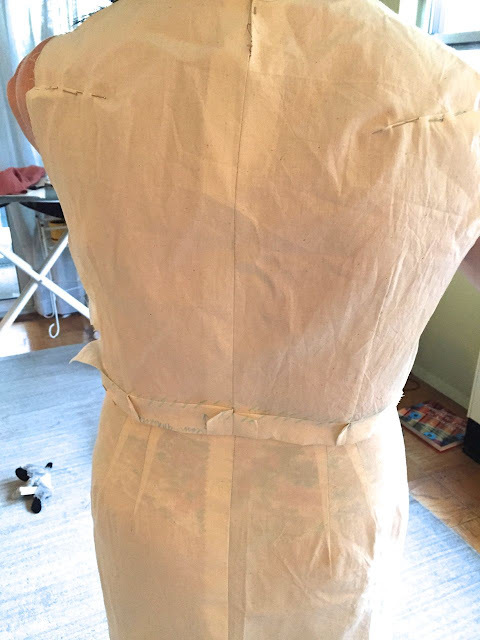 When fitting a muslin bodice, I always draw in the bust line, point, and waistline, and transfer these to the pattern, and use them in subsequent muslins to check for fit and balance. I didn't think about adding them till I read Sarah Veblen's book. I'll be sure to add them to my next bodice muslin! I do think the wrap skirt should be a little shorter. The straight skirt is perfect! Last week I was in a local fabric store here in Calgary to pick up some thread. Nosing around I saw some pins. One pin that interested me was one that looked like it would not be out of place pinned on a kilt. Why not use a pin like that if you want to have a pin in the skirt? everything looks great. i think she is going to be beautifully dressed and very happy at work and on the golf course....and DANCING DOGS!! who could ask for more? I’d be interested in knowing if the length from true waist to hem is the same on both skirts. That should resolve whether the wrap skirt looks longer b/c of the camera angle. Being a short woman myself, I like a hem to just hit the kneecap. From the photos, the straight skirt length looks just right. I really like how she looks in the full muslin (bodice and straight skirt). I think dressing monochromatically is slimming for her. She’s going to have a very nice wardrobe! May I kindly suggest that Susan add something to her top to call attention to her face. A face, woman or man, is THE most interesting part of a human (even an eager, naked lover), Collars (as on men's shirts, some women's blouses), a neck edging of a contrasting color, pleats or stripes or stitching or rickrack or most anything which more or less "points north", Even vertically striped fabric (again, often on men's dress shirts, sometimes women's blouses) make the face the center of attention. That's where the emotions are emoted. I vote for the shorter length. I agree with most...the shorter length looks better, but would like a straight on view of the wrap. Be careful of pinning the wrap skirt, it could be a good point to rip. I'd really reinforce that point inside the facing. I also agree on the broad shoulder needing to be balanced by a wider skirt, or lighter color, or horizontal seaming or stripes/panels in the skirt design if she still wants a pencil skirt. Can't wait to see how it all comes out! Thanks All for your insights & comments! I am so excited & honored to have Peter creating beautiful clothing for me!! !